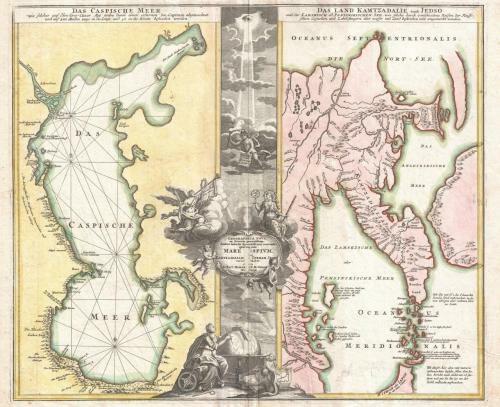 One of Homann’s most interesting and influential maps, this 1725 map depicts the Caspian Sea and the Peninsula of Kamchatka. Essentially two maps in one, Homann here juxtaposes two opposite parts of Asia: the Caspian Sea, which forms part the western border of Asia and Europe, and the Peninsula of Kamchatka, the easternmost known point in continental Asia. More on this map at Wikipedia Commons.